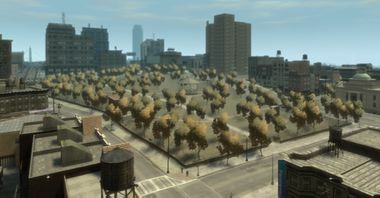 Outlook Park, seen here in GTA IV, is the centerpiece of Outlook. Outlook is a small neighborhood in central Broker, Liberty City, centered around its namesake public park, Outlook Park. It is bordered to the north by Earp Street (Downtown), to the west by Oneida Avenue (Rotterdam Hill, East Hook, and Hove Beach), to the south by Gibson Street (also Hove Beach), and to the east by Montauk Avenue (South Slopes). Outlook's residential area is bisected by the park and, as a result, both sub-areas have developed their own characters. The western part, along Oneida Avenue, has more of a trendy, hip vibe, almost certainly due to the street being the main drag of the area. The sense one may have while walking through this portion of the neighborhood almost completely contrasts the feeling one would have traversing through the lively Downtown district to the north. This portion of Outlook can be seen almost as a southern extension of Rotterdam Hill, also bordered to the north. The eastern part of Outlook, along Montauk Avenue, is much more busy and fast-paced, however. This is likely due to Montauk Avenue's status as a thoroughfare, seeing much more traffic shuffling from neighborhoods to the north to areas in the south and vice versa. Indeed, in comparison to Oneida Avenue's small duplexes, brownstones, and small specialty shops, Montauk Avenue almost exclusively contains taller apartment complexes tailored for the more affluent residents of Broker. In addition, Montauk Avenue is also home to many of Broker's government and other authoritative buildings. Aside from Outlook Park, the tw@ Internet Cafe at Cisco Street and Oneida Avenue is a popular destination in the neighborhood. 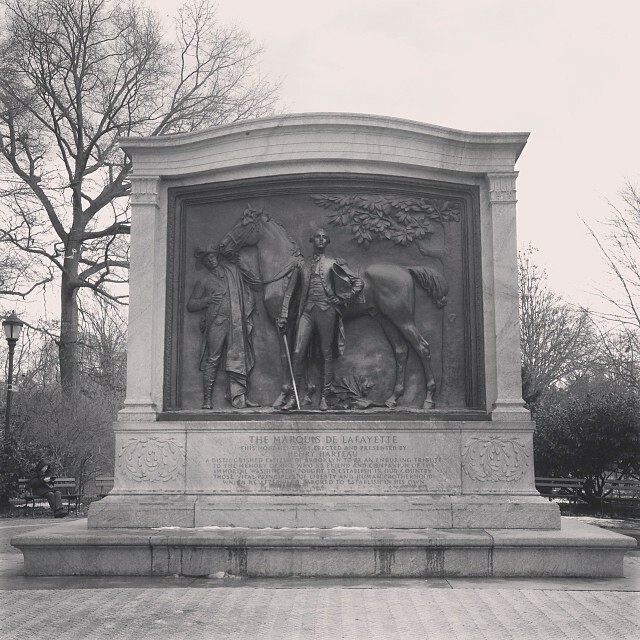 Soldier's Plaza, at the northeast end of the neighborhood, is also a very famous monument and serves as a "gateway" to the neighborhood. Additionally, Native American Engines, a spray shop, is situated on the southern end of the neighborhood. 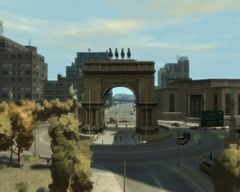 Soldier's Plaza in GTA IV, consisting of an arch centered around five columns, is located on the northeast end of the neighborhood. The building to the right is similar to the Brooklyn Public Library in appearance and location to a similar arch. Outlook Park is obviously supposed to be Brooklyn's Prospect Park, as evidenced by dead ringers of Prospect Park's eagle columns surrounding a massive arch based on the Soldiers' and Sailors' Arch at Grand Army Plaza to the northeast, and a memorial to the southeast based on Prospect Park's Marquis de la Fayette memorial; however, the neighborhood itself cannot be as easily tied to a specific Brooklyn neighborhood. Western Outlook can be seen as a tribute to the perimetrical neighborhoods of Prospect Park, specifically to its north (Fort Greene and Clinton Hill), while eastern Outlook contains elements of the neighborhoods and areas to the south (in particular, Grand Army Plaza and Prospect Park's eagle columns) and Downtown Brooklyn. The Liberty City Subway does not serve Outlook; however, there is a station only two blocks away on Sundance Street from the neighborhood's eastern border in neighboring South Slopes. This page was last modified on 20 April 2014, at 09:11.